The Oomi MultiSensor might just be the perfect Z-Wave accessory. Capable of monitoring and reporting across six different parameters it can be used for security, automation, monitoring, or general information. MultiSensor is compatible with most certified Z-Wave gateways but, with Tap-and-Touch the MultiSensor pairs instantly to Oomi Cube, the most versatile Z-Wave gateway around. The Oomi MultiSensor can be operated wirelessly up to 1.5 years with two CR-123 batteries or you can use the supplied USB cable to provide continuous hardwired power. Place it on a shelf or window sill, mount it on the wall or ceiling with the included bracket, or recess it with a compatible recessor bracket. • Detect motion to secure and automate your home. • Have lights turn on when you enter a room. • Detects a field of view of 100º from up to 16 feet away with adjustable sensitivity to avoid false alarms. • Keep your home comfortable. • Have Oomi turn up the heat whenever a room gets too cold. MONITOR, SECURE, AUTOMATE: Receive wireless notifications or create automations using any of the six built-in sensors. WIRELESS OR WIRED: Includes two CR123 batteries for wire-free use and a micro USB cable for wired applications (does not include adapter). PUT ANYWHERE: MultiSensor can be placed on a shelf or you can use the included mounting bracket to attach to the ceiling or wall. 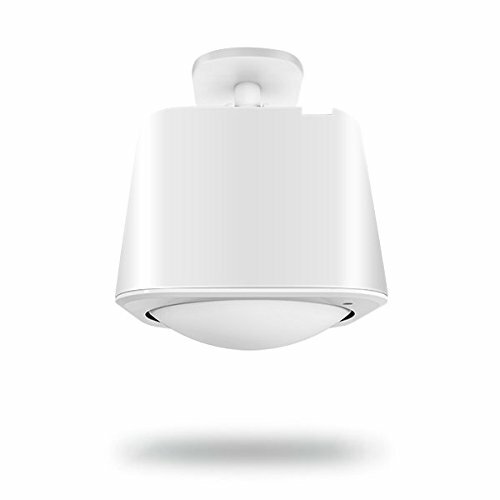 MultiSensor can also be recessed into drywall using a compatible recessor bracket from Aeon Labs. Z-WAVE PLUS: Works with most Z-Wave certified gateways. Certification number ZC10-15100014. If you have any questions about this product by Oomi, contact us by completing and submitting the form below. If you are looking for a specif part number, please include it with your message.